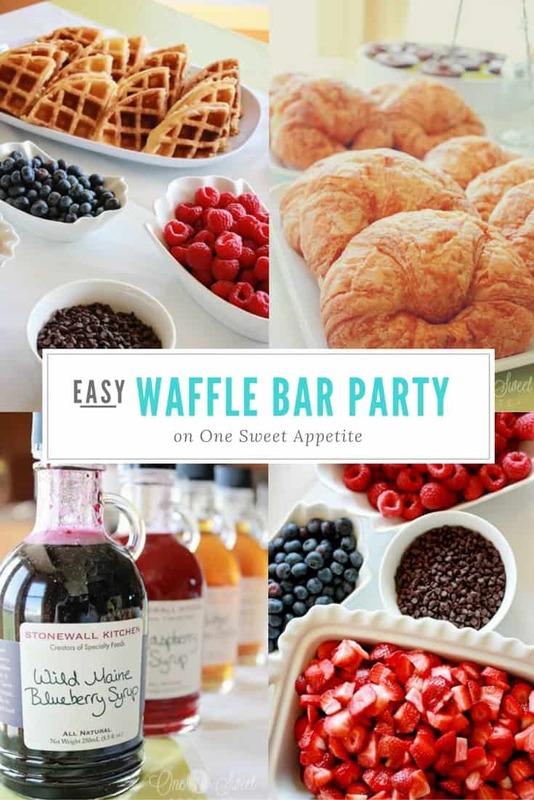 You will be looking for a reason to host brunch when you see all of the cute details in the Waffle Bar Party! See tips and ticks below on how to rock this brunch themed celebration. When my sister in law announced she was having a baby I was so ecstatic! She is the one I can relate the most to on my husbands side and I was literally over the moon excited for the news. I just knew that I was going to fall in love with her little one the second we met and insisted she let me throw her a baby shower. The idea was to throw a brunch themed gathering with a minimalist style. Easy was key and this party nailed it right on the head. 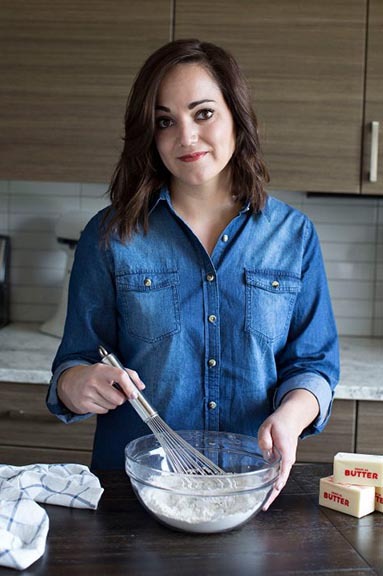 Here is the thing… I knew I wanted waffles to be the star of the show, but getting everything ready beforehand can be a challenge. I did not want to spend the entire party tied to the kitchen cranking out waffles. The tips and tricks below are PERFECT for getting started. The end result will be an elegant brunch fit for any occasion! What do you serve at a brunch party? Waffles are my top choice, obviously. But there are so many more fun items you can add to the menu. 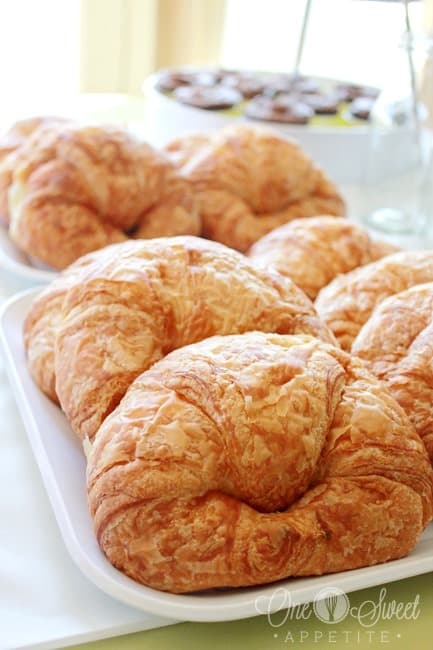 Try one of the below for a fun twist on a brunch themed occasion! THIS is the golden question. When waffles are the star of the show, you want to make sure you include items that will really compliment them. Here are just a few suggestions of what you could serve with your warm and toasty waffles. Fresh fruit. We served diced strawberries, blueberries, and raspberries. Not only are they delicious as a garnish to your waffles, but they are a beautiful pop of color on the table! 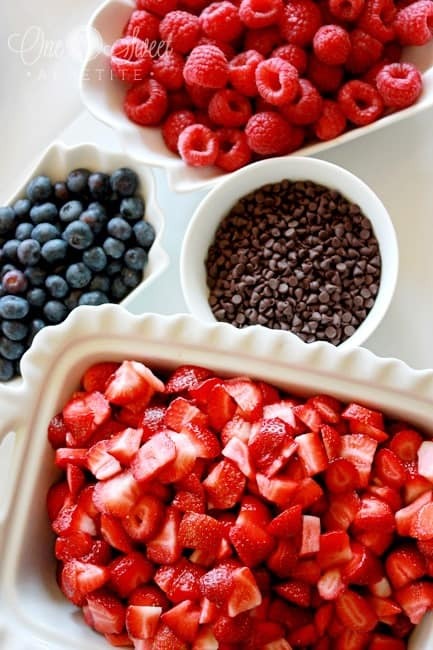 Serve mixed together or in separate bowls. Whipped cream. Make a homemade whipped cream or opt for the store bought spray can version. This adds a finishing touch that is perfect for your berry covered breakfast! Chocolate chips or chocolate sauce. Who doesn’t love a little extra sugar on top of their dish? Bonus? My homemade chocolate syrup makes a great party favor! Bottle it up and tie a cute colored ribbon to finish off the look! Honey or syrup. We decided to offer guests a variety of syrup flavors. 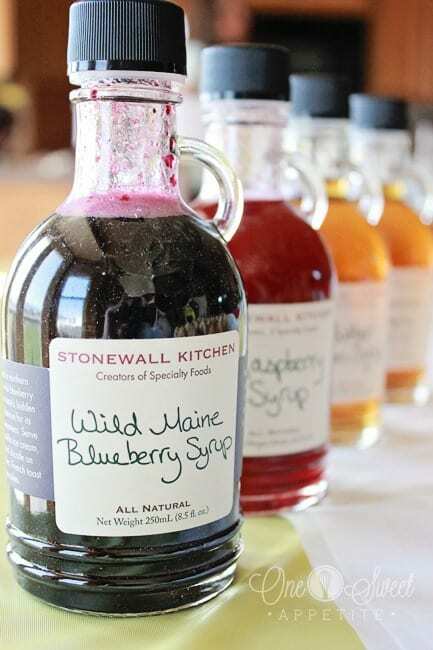 Stonewall Kitchen has some beautiful options that taste amazing! Set your oven to the lowest temperature or the warm setting. Line 2 cookie sheets with tin foil. Place your waffles into the oven and on the cookie sheet once it is done cooking in your waffle iron. Continue until you have all of your waffles cooked. Pull the trays out when ready to serve. Now, I do want to mention that this will result in a more crisp waffle. It is ideal to start making the waffles 30-45 minutes prior to your guests arrival. This should give you just enough time to make the batter and get all of the waffles cooked. I borrowed some white serving bowls and dishes from friends and neighbors keeping the look cohesive. Prepping ahead of time was a life saver. I cleaned and cut fruit the night before, used Costco croissants, and assembled the parfaits first thing in the morning. If you plan on serving granola on your parfaits I suggest setting it to the side and allowing guests to top their own. This keeps the granola from going soggy and giving them control over how much they would like added! Our party was a success. We enjoyed a simple breakfast, great company, and exchanging of gifts! It was perfect. I sent people home with a small goody bag filled with chocolates keeping with our simple minimalist theme. So what do you think? Would you throw a waffle themed party? Everything looks so delicious and picture perfect! I’m in love with those Coldstone mint bars! Congrats to your family…. little girls are so fun! Thanks Natalie! Those Coldstone mint bars are to die for! This looks amazing! I want those waffles right now! What a sweet Sister inlay you are!!! What a fun idea! I love all the different topping ideas. And those chocolate bars are amazing!! Fun party! Super cute idea! Great photos! How did you heat up a lot of waffles at once & keep them warm? We made them earlier in the morning then single layered them onto a baking tray and stuck them in the oven on the lowest setting. I pulled more out as needed. 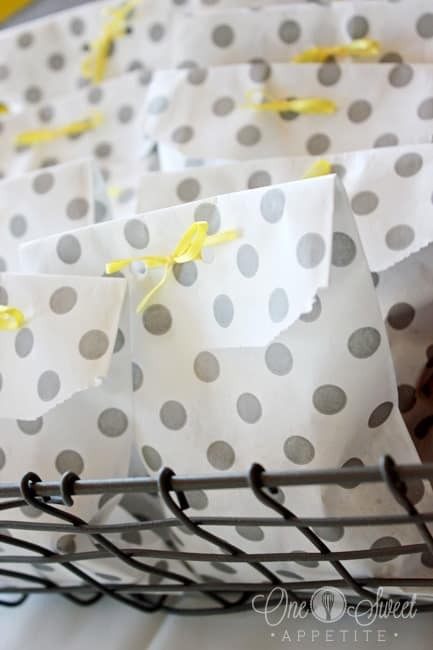 What a fun idea for a baby shower. Waffles are always yummy. That syrup looks delish, I’d be interested to try it. I just hosted a shower a few weeks ago too, isn’t it fun when someone is having a girl?! SO fun! We possibly went overboard with baby outfits… it was hard to narrow down the cute lace and pink outfits. OH and the rompers!!! I love rompers! We are in so much trouble if we ever have a girl! Jeseca, what an adorable idea for a shower! I love it! Its always hard to think of shower games, and really food is better, so I love having great food like this. yum! This looks great Jesseca! I love the waffle bar, it turned out so fabulous. Thanks Kari! It was a fun party to put together. What a fun and unique idea for a baby shower. Looks delicious!! Thanks for linking up today. Of course! Thanks for featuring my cupcakes last week! Found you over at the link party on Get your craft on! I love this idea, and I love stonewall kitchen! It was all beautifully put together! great tips, thank you and yes it is nice to have options in the syrup dept! These look wonderful! Great serving suggestions too! I love the white dishes used for the toppings and the parfait cups. Any chance you can share where a person can purchase them?